I would like to begin this post by saying that being able to live in a place where we can raise and enjoy animals is such a gift. They are fascinating (and entertaining), useful (think eggs and meat), beneficial (they eat bugs and turn soil), and are often just plain fun (think pretending they're babies). But sometimes, they drive me bananas and all I want is to drive them to the other side of the county and drop them off. I take part of that back. I really don't want to drive our bees anywhere. Actually, right now the bees aren't causing any trouble. We were very disappointed that after all our work with them last year, all five colonies died over the winter. As much as I am in awe of bees (ask my kids' friends- if any of them ask a single question about bees, I launch into a 4-part lecture series on the topic), part of me wondered if we should give up. But we didn't. We ordered two more packages, watched them build up over the summer, left their honey alone, and we now have six colonies as we head into this winter. Jamey made moisture quilts to hopefully insulate them from condensation which can be fatal. We'll say a little prayer, tuck them in and hope that we see at least a colony or two alive this spring. The ducks. We bought four Khaki Campbell running ducks from a farmer we know. We wanted them for their eggs and expressed that we wanted hens. Well. Either they weren't hens or they just didn't like us because we got one and only one egg (and it could've been a chicken egg- it was hard to tell) and that was it. The very first night we had them, one of the four went missing. We're thinking predator. The other three fell into a cute routine of quacking around the chicken yard each day, splashing in their water and then hunkering down in the chicken tractor out in the yard. They never followed the chickens into their coop as they need their own water source (so they can scoop-drink). Well, after a few weeks of this pleasant (albeit non-laying) life, they discovered they could get out through the holes in the fence (they were small enough). Over a few days, two walked their way out onto our road and got hit by cars. Bless our dear neighbor who scraped them off with his shovel. So there was one duck left. Without his friends, he no longer stayed in our yard and instead wandered the neighborhood becoming a bit of a nuisance. He's no longer with us (and that's all I'm going to say about that). So the duck project was a fail. I feel yucky about the whole thing but we couldn't spend hundreds and hundred of dollars installing new fencing and other attempts to solve the problem weren't working. Frankly, non-laying ducks were just not worth it to us. Moving on to my most recent nemeses: the chickens. We haven't bought chicks the last couple years so our chicken population has slowly been aging and dying out. We're down to around ten. At one point, we had 40 (that included some meat birds we later butchered). Of these ten, about 3-4 consistently get out of their yard and into our neighbors' yards. Turkey has learned to ignore them, thank heavens, but they wander around, digging up everyone's flower beds and newly planted grass. Here again, if we spent a lot of money, we could fix the fences (they've been patched COUNTLESS times). We could buy a lot of organic, free range eggs with that money. But we don't have the heart to get rid of the chickens. So, for now, they're locked up in their coop. It's not a terrible place to be. I'll be adding leaves and straw to give them something to scratch and maybe on really nice days we'll let them out for awhile to enjoy their yard. You know, on good behavior. In the meantime, I want to price out fencing and see if we can't re-fence part of the yard or make something work. Before we moved out here, I bought into all of the "how sweet and wonderful it is to have small livestock" stuff. 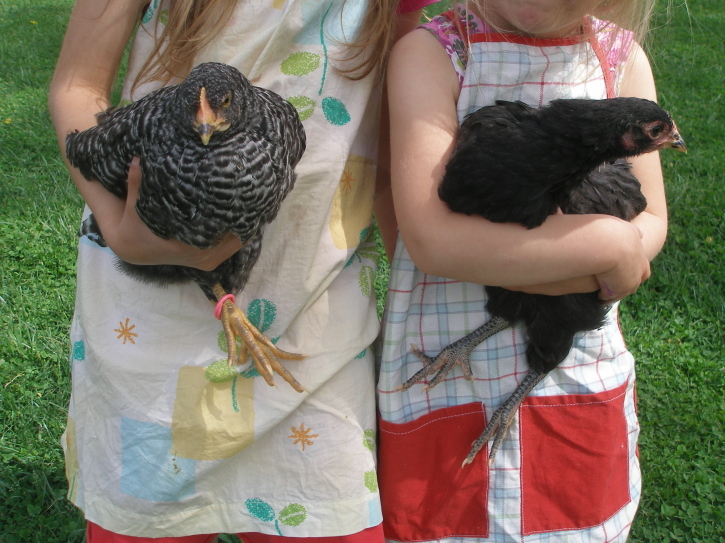 Oh, boy, and then I learned about goats climbing on top of my wringer washer, and chickens pooping everywhere, and let's not forget how well chickens and unfenced gardens go together. It's definitely not all sunshine and roses! Our chicken flock has been aging and dying, too, and I'm trying to get up some "Round-Tu-It" to get the last of them slaughtered before the really cold weather kicks in. I'm glad it's not just me:-). I recently found my way back to your website- it looks (and reads) great! I hear ya! We have had some issues with ours bees also, and our chickens (though we love having them) do as they please which can sometimes be annoying. Most of our chickens stay in a portable chicken fence or in their run, but the chickens we got this past spring are an independent bunch. They escape the fencing by flying over, and for a while that was fine. Now, though, they are roaming further into the field behind our house and scratching around for goodies planted there, so we too have started locking them in their coop for a few days. It would be nice if we could get these animals to do exactly what we want, wouldn't it?! Yes. Some sort of chicken obedience school would be lovely. We have kept chickens successfully fenced with just 2 wires of electric at 3 and 8 inches off the ground. We could have never afforded to give our girls as much range with regular fencing. Our bantams don't want to be penned up like the other chickens. It is so much more fun to spend the night snuggled right at the front door. And you know what they leave. The ducks do look female - no curled tails. The top bar hives are really what made me comment. I was told they are difficult, but you tell me which type of hive you like the best. We successfully wintered ours this past year, but then had an early spring and many of them moved out. We haven't been using the Langs for long but we've really enjoyed the top bar hives- especially as new beekeepers because you can really see into the hives/frames well and really watch what they're doing. The only downside that I can really see is that there is no good way to separate the queen from the honey frames so come harvest time, you have some mixed comb. On the other hand, we love not using foundation...ask me again in a couple years and I should be able to give a fairer comparison ;-). We had chickens for years on our farm. We had their wings clipped and had fencing ,but nothing really worked to keep them contained. I finally gave up on having nice flower beds and unmolested gardens. This was quite a few years ago, so perhaps things are better now. We would get about 150 every spring. Hmmm...we've had roosters in the past and you're right- we had less of a problem with wandering then. Thanks for reminding me of that!